On 9th October 1514 Mary Tudor, sister to King Henry VIII, was married to King Louis XII of France. Mary was just 18 years old whilst Louis was 52. The wedding took place in the great hall of the Hôtel de la Gruthuse, Abbeville. Mary wore a French style gown of gold brocade that was trimmed with ermine whilst King Louis also gold and ermine. 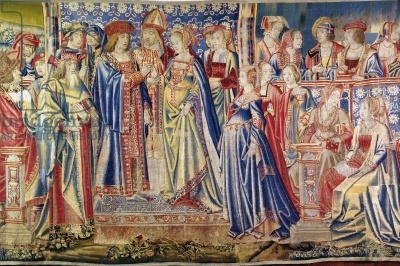 In place of her brother, Henry, Mary was given away by the Duke of Norfolk and the Marquis of Dorset and the Bishop of Bayeux performed the ceremony itself. “Then followed the Queen, under a white canopy, above and around which were the roses, supported by two porcupines. She was alone beneath it, and Monseigneur (d’Angoulême) on her left hand, but outside. She rode a white palfrey, with rich trappings, and was herself clad in very handsome stiff brocade. Next came her litter, very beautiful, adorned with lilies; then five of the principal English ladies, very well dressed; then a carriage of brocade, on which were four ladies, followed by a second carriage with as many more ladies. Next came six ladies on horseback; and then a third carriage, of purple and crimson velvet, with four ladies; after which a crowd of ladies, some twenty in number; then 150 archers in three liveries. In this order they went to the Queen’s house, which was near that of the King. It was a sumptuous entry, and these noblemen of England have very large chains, and are otherwise in good array. Before the entry there was a heavy shower, which drenched them all, especially the ladies. The Queen was dressed in the English fashion. In the evening, ‘Madame,’ the King’s daughter, wife of Monseigneur d’ Angoulême, went to visit her, and they gave a ball. This morning the King had preparation made for the mass in his own hall, whither the Queen came, preceded by 73 English barons and gentlemen; the King doffed his bonnet, and the Queen curtseyed to the ground, whereupon his Majesty kissed her. The treasurer Robertet then presented to the King a necklace, in which were set two beautiful jewels, and his Majesty placed it round the Queen’s neck; after which mass was performed. The two candles were held, the one by Monseigneur de Vendôme. After the King had kissed the 1 pax at the mass, he kissed the Queen. At the offertory Monseigneur gave the money to the King, and Madame to the Queen. The mass by Cardinal de Bayeux being ended, he gave the consecrated wafer, one half to the King and the other to the Queen, who kissed and then swallowed it; and after making a graceful curtsey she departed, the King and Queen going each to their own apartments to dine. In the evening the Queen arrayed herself in the French fashion, and there was dancing; the whole Court banqueting, dancing, and making good cheer; and thus, at the eighth hour before midnight, the Queen was taken away from the entertainment by Madame to go and sleep with the King. The marriage would last just three months with King Louis XII dying on New Year’s Day. Mary would go on to marry Charles Brandon.